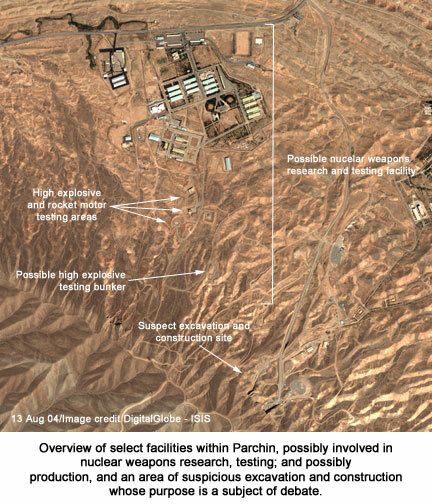 The Parchin military complex, located about 30 kilometers southeast of Tehran, is a huge site dedicated to the research, development, and production of ammunition, rockets, and high explosives. The site is owned by Iran’s military industry and has hundreds of buildings and test sites. Within this larger complex, there is an isolated, separately secured site which may be involved in developing nuclear weapons. 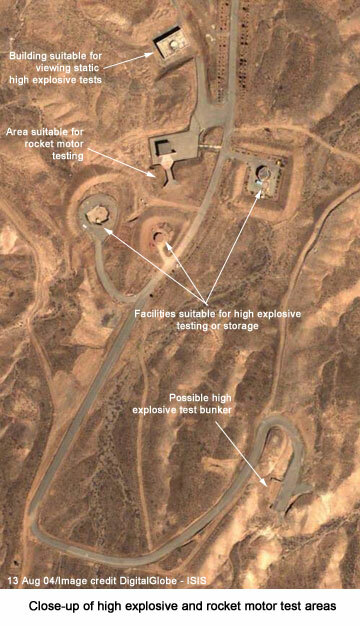 ABC News learned that US experts have assessed that this site may be involved in the research, testing, and possibly production of nuclear weapons. According to the Agence France-Presse (AFP), the IAEA has known about this site for some time and it has independently assessed its potential for nuclear weapons work. 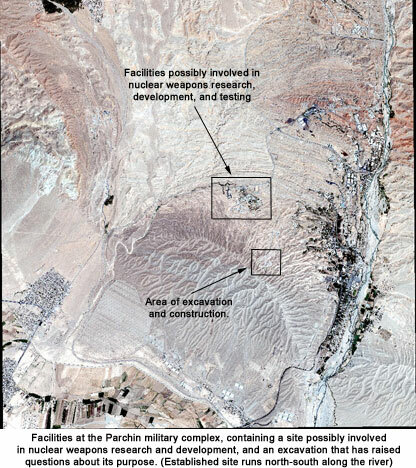 As a result of its analysis, the IAEA recently asked Iran about visiting this location. But Iran has so far not agreed, added the AFP report. Based on a review of overhead imagery of this site, called location 1 in this report, this site is a logical candidate for a nuclear weapons-related site, particularly one involved in researching and developing high explosive components for an implosion-type nuclear weapon. But the evidence that this site is conducting nuclear weapons work is ambiguous. Some facilities seem more suited to armaments research or rocket motor testing. Despite the ambiguity about the purpose of this site, the available evidence appears sufficient to warrant a request for a visit by the International Atomic Energy Agency (IAEA) of this site. Location 1 has high explosive testing facilities that could be useful to a nuclear weapons effort. At one area, there are buildings that that are suited to conduct high explosive testing. Such buildings would have flash x-rays and fast cameras for recording the explosion, and some of the buildings appear suited for such use. Arguing against the area being solely dedicated to high explosive work is another building that appears to have a pad oriented for testing small rocket motors and not high explosives. Nearby, but further isolated, there may be a high explosive testing bunker where explosives are detonated outside and assessed from inside the bunker. Such a bunker, which is partly buried, would allow the study of large explosions for a variety of purposes, including the development of nuclear weapons. This bunker, if that is what it is, has increased suspicion that the site may be involved in researching nuclear weapons. 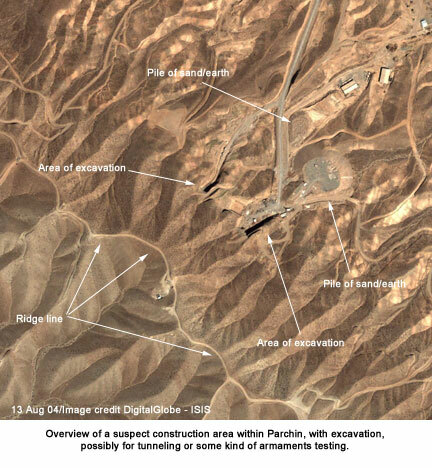 According to US officials, referenced in media accounts, the concern is that this bunker could be where Iran would test a full-scale mock-up of a nuclear explosive using natural or depleted uranium as a surrogate of a highly enriched uranium core. Such tests can provide key confirmation that a nuclear weapon will work adequately once HEU is substituted for the surrogate material. Iraq had constructed a high explosive testing bunker at Al Atheer prior to the 1991 Persian Gulf War partly for such a purpose. The bunker at location 1 has some characteristics, such as being partly buried, similar to the Al Atheer bunker. 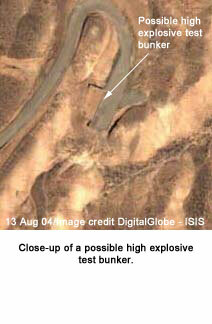 However, the imagery of the bunker at location 1 is not sufficient to draw detailed comparisons. At the main part of location 1, there are two igloo-shaped structures, that appear designed to contain hazardous operations. Although their purpose cannot be discerned from the image, these closed structures may be involved in tests involving shrapnel. The purpose of other buildings at the site is not apparent from the image. However, facilities involved in nuclear weapons research, development, testing, and manufacture can have few defining characteristics. A construction site located about 1.2 kilometers from the above site also warrants attention. The construction involves the excavation of a hilly area. This excavation may be intended to use the hill to physically support a future structure. It may have also involved tunneling into the side of the hill. The actual purpose of this site is difficult to discern. 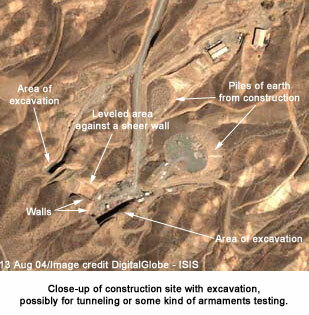 If tunneling is occurring, the site could have a range of purposes, none of which can be singled out from the imagery as more likely than the others. If no tunneling is occurring, the site could be for some type of armaments testing. Some analysts have suggested that this site does involve tunneling associated with an underground full-scale nuclear weapon test. In such a scenario, the tunnel would go into the hill and likely down well underground. However, this construction site is close to many buildings at Parchin. As mentioned above, it is only about 1.2 kilometers from the site suspected of being involved in nuclear weapons work. 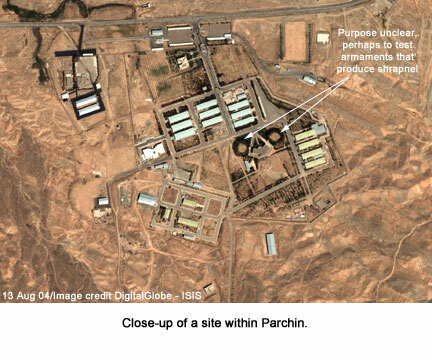 It is about 2.5 kilometers north of another site at Parchin and about one kilometer west of another facility. Thus, this construction site appears too close to other facilities to be an underground nuclear weapon test site. Nonetheless, suspicions of such a purpose may continue, and thus an IAEA visit could alleviate those suspicions.